If we really wanted to unite all San Franciscans, we’d stop talking about soaring rents, tech buses, gentrification, and politics for five minutes, and instead bond over something we all love. 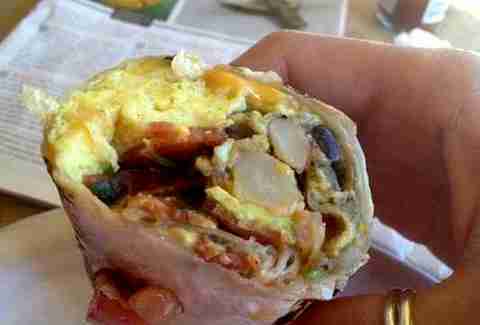 So here are the 11 best breakfast burritos in SF, all of which we thoroughly enjoy even when we don’t feel like dying. 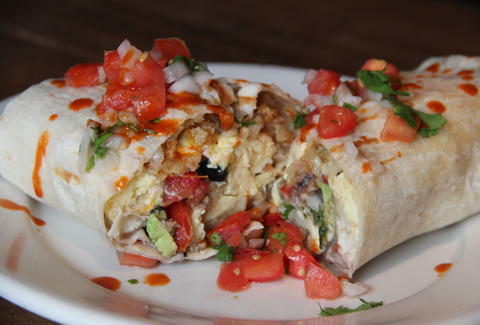 Ground Rules: Other than a tortilla and eggs, ingredients in a breakfast burrito are something no one seems to agree on. Should there be beans? Potatoes? Cheese? We think there’s no right answer, so as long as you can get it during breakfast-ish hours and it resembles a burrito, we consider it fair game. Located in the Financial District and closed on weekends, this is the spot to hit up after you go a little too hard on a school night (no judgment, just trying to help). 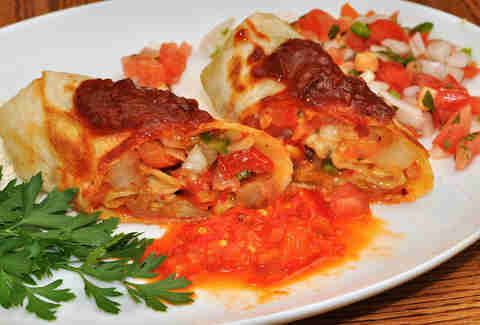 Order the Caramba Chorizo. Add potatoes. It’s on the small side, but it’s cheap and it won’t put you in a food coma later on when you’re at your desk “working”. Another FiDi spot that’s only open during the work week, this place is known for its cheap and filling breakfast burrito (in other words, don’t order the regular burrito). 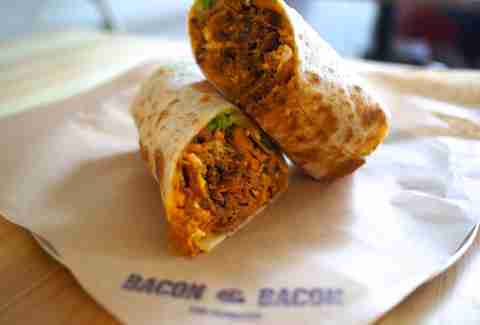 It comes with bacon, ham, AND chorizo, so you don’t have to play favorites. Oh, and they load it up with refried beans, which can make it a little messy, but you weren’t actually going to use your keyboard to get any work done anyway, so just deal with it. Depending on how badly you’re hurting, too, they have “Baby” and “Super” sizes. So... Super. The breakfast sandwich at Bacon Bacon is so good, it’s almost hard to order the Breakfast Burrito -- but you can solve that problem by just going there more often. The seemingly small (but totally filling) burrito is packed with scrambled eggs, bacon, avocado, cheddar, and, oh right: pork shoulder. Squeal, little piggy! 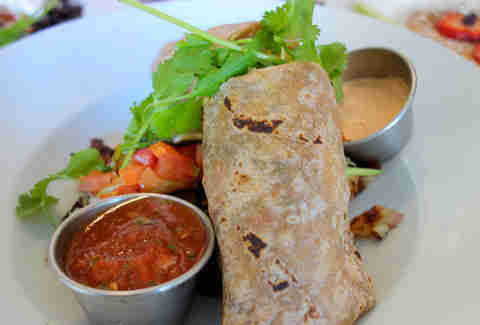 Seriously though, this is one of the most flavorful breakfast burritos you’ll find in SF. Café deStijl is on the Embarcadero by Telegraph Hill, which basically means it may as well be in another state, but their breakfast burritos make the trek worth it. Super-fluffy eggs, apple-smoked bacon or sausage, avocado, house-made salsa, and cheese are all rolled up in a tortilla and then quickly grilled for perfect, melty goodness. At $10, it’s a little pricey, but most things described as 'perfect, melty goodness' usually are. Bonus: it comes with fresh fruit and potatoes! A neighborhood favorite for Potrero Hill locals, Thinkers Café is small but has seating indoors and outdoors AND has free Wi-Fi... so you can pretend to work with the rest of San Francisco while you chow down on your spicy breakfast burrito with bacon. If you don’t like spicy breakfast burritos, you can ask for less sauce while you ponder exactly where you went wrong in life. Located in NoPa (psych! On Divis), The Bean Bag Café doesn’t actually have any bean bags (dumb), but it does have a $5.95 breakfast burrito (way less dumb!). You’ll have to pay $2 extra to add meat that you don't technically need since it’s stuffed to the brim with eggs, potatoes, avocado, cheese, salsa, and black beans, but that you kind of do need to add because, well, sausage. Also: it’s legitimately huge, so you could share if sharing were something you were into. Scrambled eggs, beans, Mexican potatoes, sautéed poblano chiles, and smoky chile salsa all combine for a perfect flavor combination that makes this another spot where the breakfast burritos taste better than the regular ones. The portions are huge, so you’ll leave totally stuffed -- especially if you also take advantage of the chips and salsa bar. 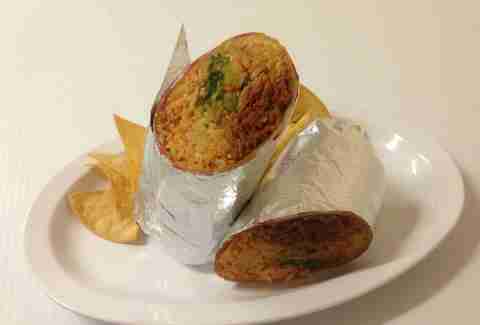 Warning: this burrito definitely flirts with being “wet-style” -- if you’re not down to use a fork and knife to eat burritos (totally understandable), you might want to skip this one. First step: find the hour-long line for Zazie brunch. Next: walk right past it and down the block to Reverie Cafe. 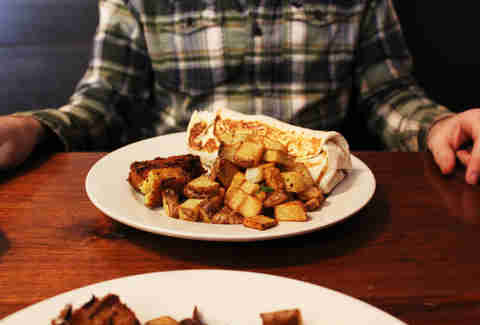 Then: order the breakfast burrito and pay with cash (only). 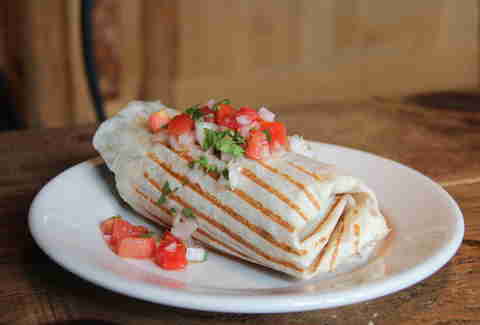 Six bucks will get you a good-sized burrito filled with eggs, beans, cheese, and chipotle sauce. Choose between veggie (spinach and potatoes) or spicy chorizo. Finally: find a seat in the garden and enjoy, while feeling slightly superior to all those other people still waiting in line for their Eggs Benedict. When you think of North Beach, you probably don’t think of Mexican. In fact, you probably don’t even think of North Beach that often. 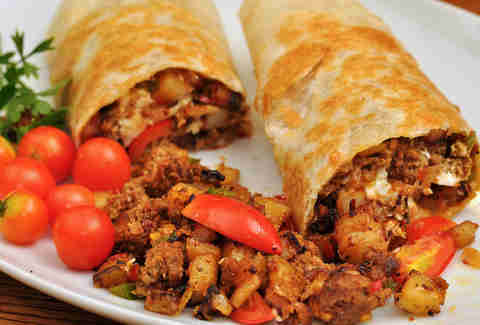 When you do, though, make sure Don Pisto’s breakfast burritos are part of the thought process. 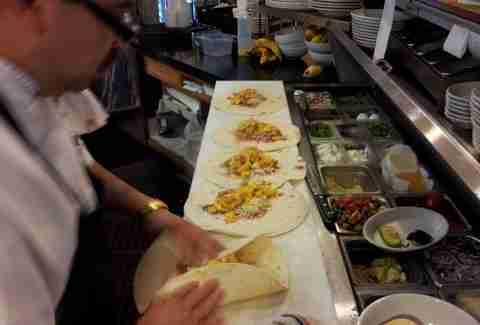 There’s only one morning burrito on the menu: chorizo, queso Oaxaca, eggs, rice, beans, and arbol. It’s the perfect size: not too big, not too small (that’s what she said... and you're not sure if it's a compliment?). Oh, and they have bottomless mimosas; you’ve been warned. Important FYI: Breakfast is only available on Fridays, Saturdays, and Sundays. The most expensive burrito on the list ($9.95 with an additional $2.75 if you want to add meat), this is also one of the best. The eggs are scrambled to-order, the rosemary hash browns add a delightful crunch, the avocado is fresh, the black beans are not too wet, and you get cheddar AND Jack cheese. 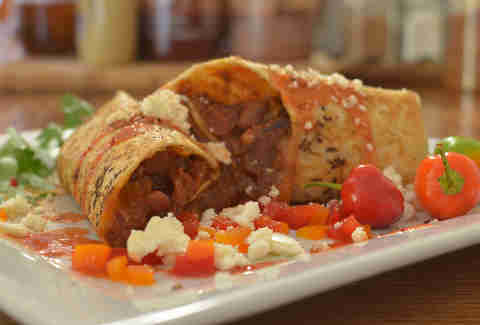 Truthfully, this one is one burrito where you can forego the meat without shedding any tears. Okay, FINE, but only a few. 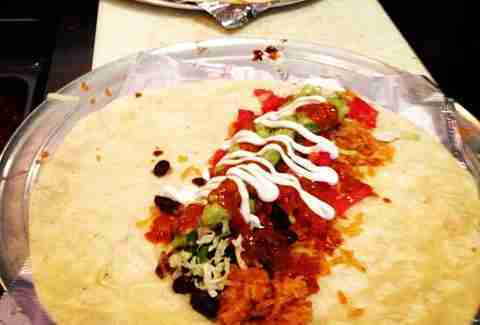 Daisy Barringer is a Thrillist contributor who strongly believes burritos should never be shared. Follow her on Twitter @daisy.